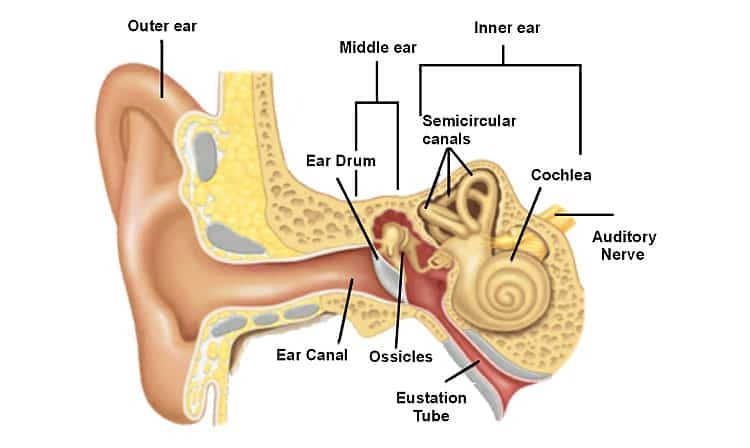 The ear is divided into three basic parts: the outer ear, the middle ear and the inner ear. Hearing loss can result from problems within any of these parts. This is a loss caused by a problem in the outer or middle ear. It is called “conductive” because something is blocking the movement – or conduction – of sound into the ear. The canal can be blocked by earwax, infection, a tumor, or a foreign object. The eardrum can be damaged by injury or infection. In the middle ear, abnormal bone growth, infection or tumors can block the sound. Most conductive hearing losses are medically or surgically treatable. This type of loss is caused by a problem in the inner ear or the auditory nerve. When damage occurs to these areas of the ear, sound may not only be damped but also distorted. Also called “nerve deafness,” it usually occurs in both ears. An audiogram is a graph that shows your hearing levels for various pitches of sound. The frequency (pitch) of the sounds are displayed left to right on the graph while the softest level that each sound was heard is displayed from the top to bottom of the graph in decibels (loudness) – the top of the graph indicating better hearing. Red circles indicate the hearing for the right ear while blue “Xs” indicate the hearing for the left ear. Hearing loss is typically placed into categories but the amount of hearing loss can vary by pitch. For example, you may have a mild hearing loss for lower pitched sounds and a more severe hearing loss for high frequency sounds. Call Today To Help Your Hearing Loss!